Vacation rental duplex. Sleeps 4, 2 bedrooms, 2 bathrooms. Cats, Dogs allowed. Welcome to Enlisted Men's Mess Hall! Your stay in history begins at these gates! Step up into military history! Great fenced yard and the screened porch of Enlisted Men's Mess Hall. On a super quiet street. We love this location. This handpainted sign graces our picket fence. The yard is fully fenced-in and ideal for kids and dogs to play. 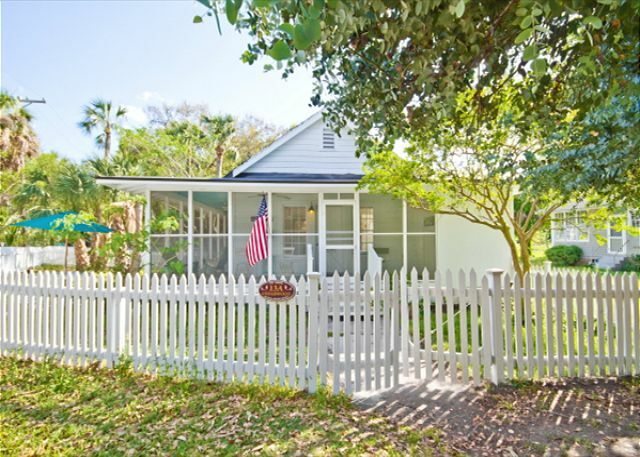 A white picket fence is always a good start to a perfect vacation! 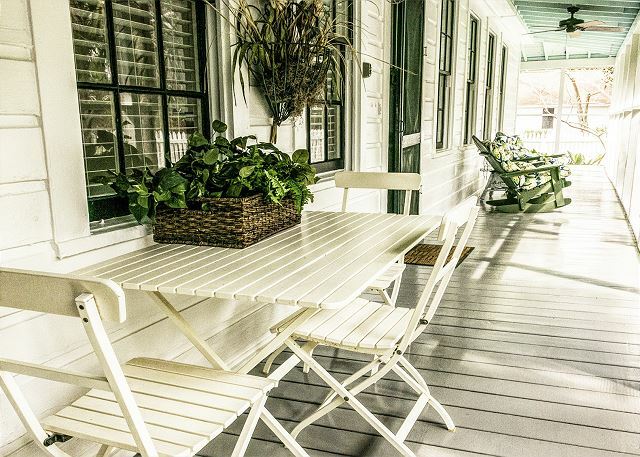 Part of Tybee's National Historic homes, you'll be greeted by a reminder that you're about to step back into Tybee's history. This front/side yard is so amazing. Pet friendly, Fido will love being here watching the world go by! Front yard ~ we are in a very quiet neighborhood and this screened porch is perfect for saying 'Hey y'all!' to your North Beach neighbors. 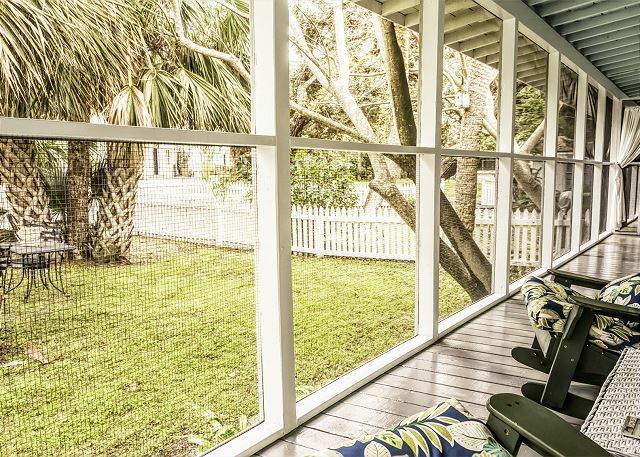 The wrap around screen porch is a great place to relax and enjoy Tybee! 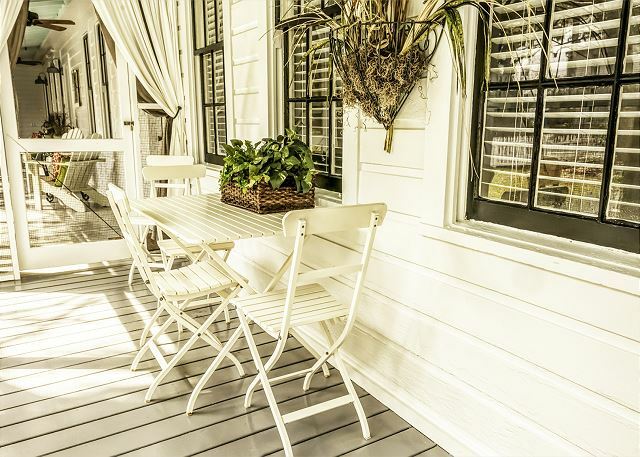 Sit here and enjoy a little screened in porch time. Speaking of Screened Inn, this home is a duplex, and is great for families who want together time while having their own space! Porch living is the only living for me! 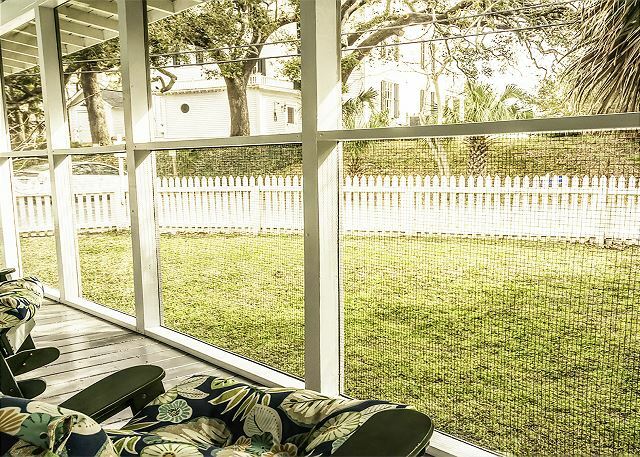 Screened in porches are the only way to go on Tybee! Sit here and enjoy your complimentary Mermaid Morning Bliss (MMM Bliss) coffee! Cute living room for this adorable little cottage! Why yes, I will have a seat! It's the little things that make this home so very special. Kitchen and living room. This setup allows for family time! Lovely little kitchen. Open to the living room. Cuddle up right here! Queen bedroom with the master bath. Is cute supposed to be this comfortable? Cute second bedroom with matching twin beds. Great for groups to sleep in separate beds or kids to sleep together. Second bedroom with two twin beds. Second bedroom, two twin beds. Door leads to front porch but you and your guests can come thru the side door. 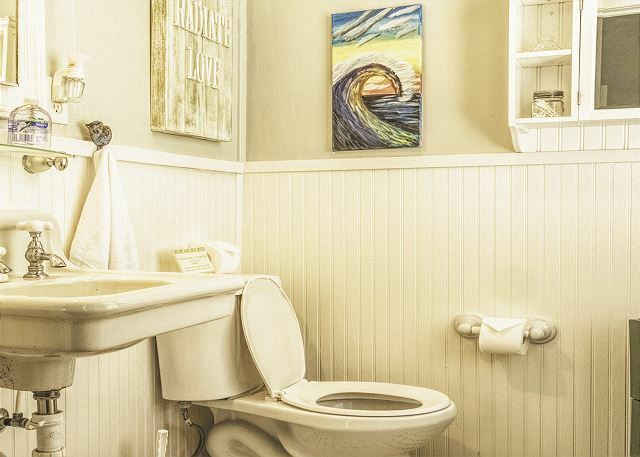 We now have the two full bathrooms but in true Tybee tradition, is a little quirky. 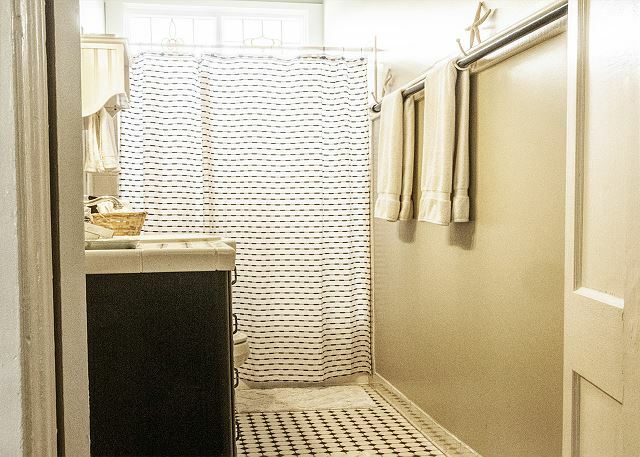 The bathroom and sink are in one room and the shower are in the other room. Both rooms are in the 2nd bedroom - where the two twin beds are. Wonderful addition! Second full bathroom. Standup shower (small step in). 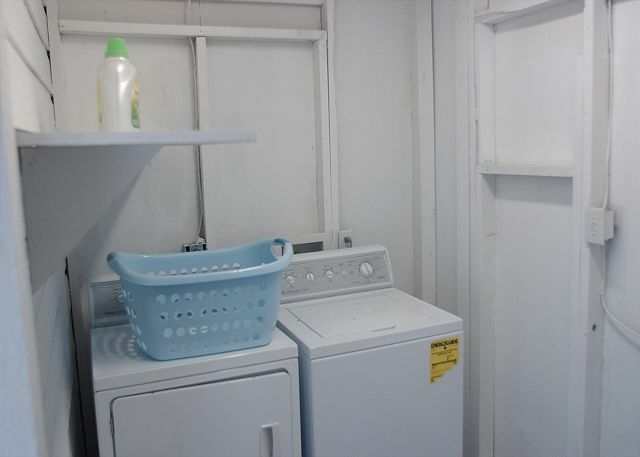 Washer and dryer in the laundry room. Come see us soon at Enlisted Men's Mess Hall! This historic Ft. Screven structure has been completely restored and renovated. 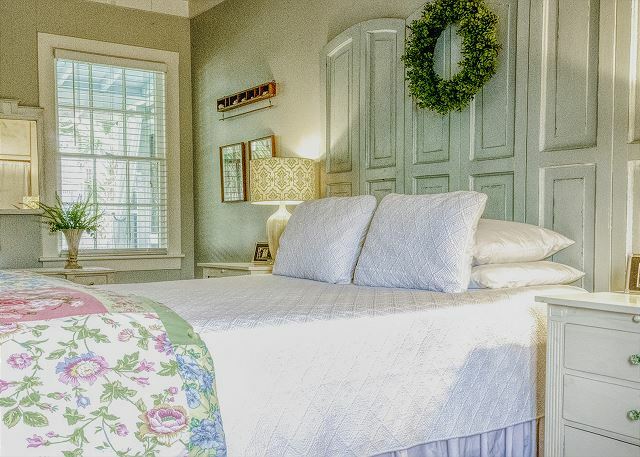 Layla Palmer of The Lettered Cottage fame has completely redecorated this amazing home and is a recipient of the Tybee Island Historic Society Preservation Award!!! Originally built as one of three Mess Halls for the fort, this home has had a long and colorful history including time as a boarding house. 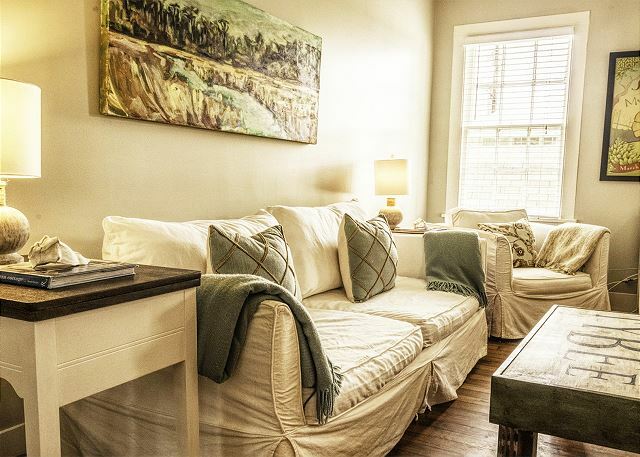 This duplex with Screened Inn on the other side with its own private entrance, Enlisted Men's Mess Hall features tall ceilings with ceiling fans, extra large windows in every room, hardwood floors and wrap around screened porch. Fenced-in yard with large palms and live oaks. 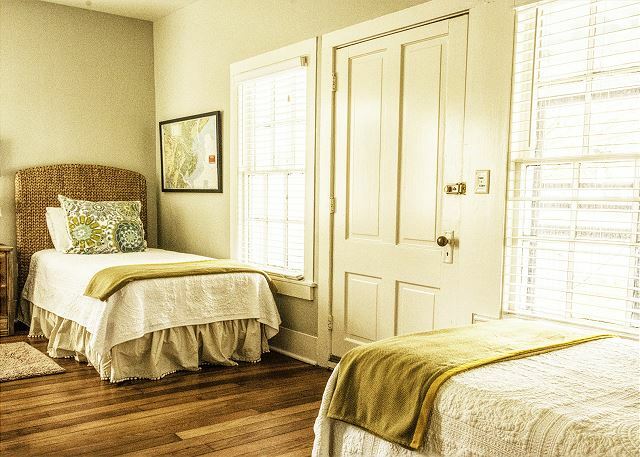 Two blocks from the North Beach, 5 minutes from the Tybee Light House Station and the North Beach Grill restaurant. The Jaycee Park (ball fields, walking path, playground) is located directly behind the home. Ground level, easy to access, pet-friendly. Complimentary off-street parking for 2 cars. Parking is parallel to the white picket fence on the grass or you can pull into the right side of the picket fence. This was our first visit to Tybee Island and stay with mermaid rentals,it will not be our last. 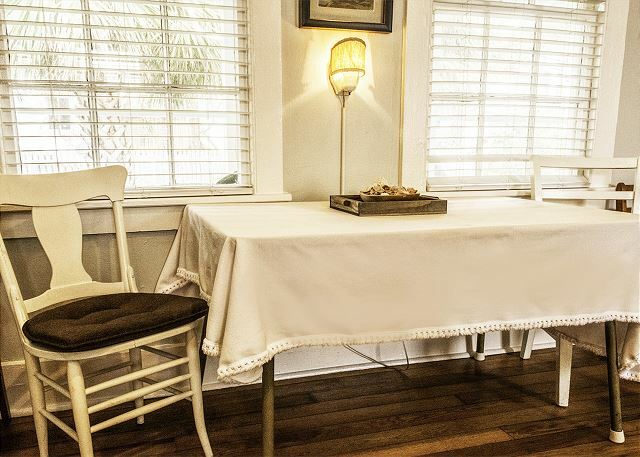 The Enlisted Mens cottage was perfectly located in north beach with everything we needed for a relaxing stay. Day trips into Savannah and exploring the island could not have been easier. Thank you mermaids for a great stay. Rented the cottage to be in the area for my mother-in-law's 91st birthday party. Great location on north end of the island-close to lighthouse. Property was clean and ready right at check-in time. As I have rented several cottages from Mermaids Cottages, this one was one of my favorites. Would definitely stay here again. Wonderful place and management Co.
Love dealing with Mermaid Cottages and the cottage was great as well. Only gripe is that this unit has a shared wall with the next door residence and there is no sort of sound barrier between the master bedroom and the next doors living room, so it is like I was trying to sleep in the neighbors living room. Otherwise it is perfect. The rental unit was beautiful. We loved that it was dog friendly, near both the beach and a great park, and on the North end of the island. 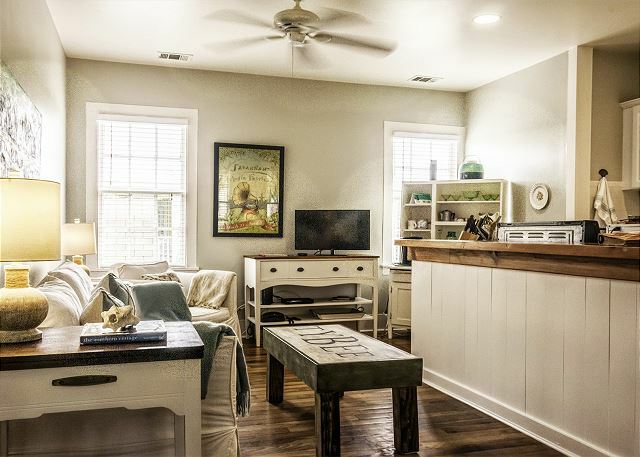 We would highly recommend this rental to anyone visiting Tybee. A Hidden gem! If you like to be out of the hustle and bustle - if you like character and don't mind if the floor is not always level- it feels more like a home than a hotel room. I would stay here again in a heartbeat! My only negative is that the double bed mattress was too soft for my liking - you know where you have to hang on to the edge to prevent rolling into the middle! Suggest the owners replace 2 of the 3 mattresses. Otherwise it was perfect! I vacationed with my 2 adult sons. We had an awesome time! From the moment we walked into The Mess Hall we felt at home! Everything was clean, smelled wonderful and the lights and music were on when we walked in! Loved how it is decorated also! Lots of vintage items and antiques. Wonderful wrap around porch that was great to sit and drink coffee in the morning! Everything was perfect! We ate at AJ's Dockside which was wonderful. The beach was beautiful and not many people. We had Wen McNally Photography take beach pictures for us and what a wonderful experience! She was great to work with! Already planning our next vacation to Tybee Island!! We had a wonderful time on the Island. The home was perfect for our needs. Charming, relaxing, and close to everything we wanted to do on the Island. The Cottage was very cute and perfectly renovated. Loved the large porch. The walk to the beach wasn’t bad at all and the Beach wasn’t crowded at all either. The customer service team was very attentive and professional. Def recommend! Rental experience was very good. Mermaid Cottages did an outstanding job. 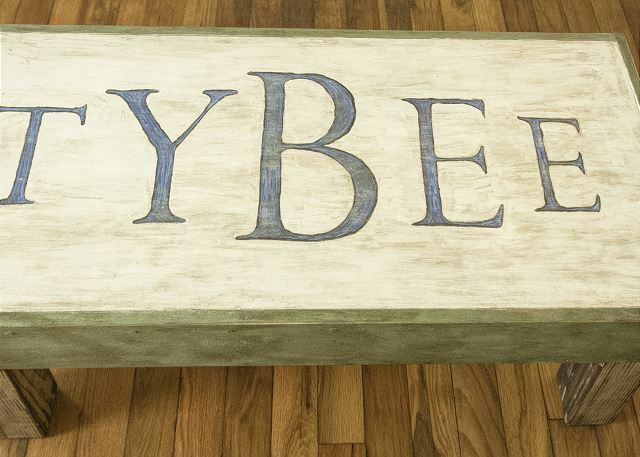 Love the location and Tybee is a great place for a relaxing atmosphere. As always when we come to Tybee, Diane and her staff of "professional" Mermaids have laid the foundation for a wonderful stay at the Cottages. 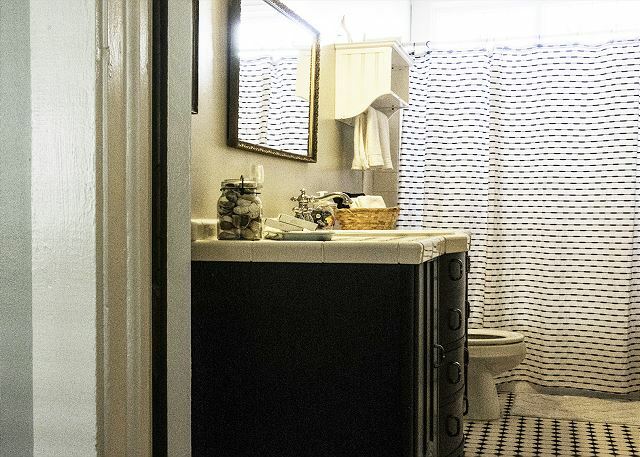 The attention to detail, cleanliness, and welcoming touches are things you just don't get via other rentals. As long as there's a Tybee Island, and as long as we believe in Mermaids and the healing power of the ocean, we will continue our sojourn to this wonderful, magical place. Enlisted Men's is the perfect spot for two, three or four people. Just enough room, and privacy, secret garden walk to the beach, and we love the porch! While we don't want to rush time, we can't wait to return! I thought the cottage was immaculate! Smelled wonderful upon our arrival. Beautiful home in a beautiful neighborhood. We rented a golf cart so we could explore the island and go down to the second street beach entrance. The beach access here is nice but it’s narrow and would be hard to carry chairs and beach gear. Spiders were also hanging out in the path. We stayed six days and 4 towels, 4 washcloths, were left - I thought that was skimpy for 4 people. Staff were super helpful and offered to have a maid come down to bring us more. Only trash bags were what was in the cans. We had to buy more but that’s ok just a heads up, they tell you this on your check in email. Great week st the beach! Ideal cottage for a relaxing time for just the two of us. Although the weather forecast was gloomy, the weather cooperated just fine. We did everything we had planned; rode bikes, hunted for shells on the beach, trips to Savannah, ate at AJ’s & The North Beach Bar & Grill, rocked on the porch and I could go on and on. The cottage was clean and everything we needed was there. Jennifer worked with us to make our reservations work and was so helpful during our stay. Probably time to replace the mattresses but still not a bad sleep. Love Tybee and we are still figuring out how to become a permanent part of this great island vacation spot. Also loved how the city is reclaiming the beaches and how clean they are kept. See you all again next year! We stayed at the Men's Mess Hall last week and found it to be more than what we ever expected. It has been so well cared for, decorated down to details to fit the time period in which it was built, clean, and the Mermaids were always available to answer any questions we might have had. This was our second trip to Tybee and our first on the north end. We loved the location of this cottage. Just a short, less than 5 min. walk to the beach... through a beautiful jasmine lined path, out the gate and across the boardwalk. The neighborhood is so quiet. Thank you, Mermaids for the great week at the Enlisted Men's Mess Hall. I hope we can return someday. What a perfect place! We had a great time! The “mess hall” was charming and very quaint. The neighborhood was also very cute and we enjoyed learning about Fort Screven. The beach access was super convenient and was like walking through a secret tunnel of jasmine! We went to some great little restaurants and had a beautiful beach day. Only wish we could have stayed longer! Our dogs had a great time too! This is our second stay in this cottage. We LOVE it. It's perfect for our two Scottish Terriers and this part of the island is so peaceful with many places to stroll with out dogs and just a quick hop over the Officer's cottage area to the sea. The cottage itself is very nice and decorated just as you'd want it - to reflect a lovely island cottage. Also the place was spotless. Mermaid Cottages are great, we have stayed at their rentals at least 5 times and counting and have not been disappointed yet. Clean/nice places that are well kept and the staff is wonderful as is their maintenance crew (we had an A/C unit go out one year and it was fixed that day!). Highly recommended! this was our first visit to Tybee. Proximity to Savannah is great, however we prefer a beach that allows dogs. Our only complaint has to do with Tybee Island itself not the cottage. The cottage is wonderfully decorated, the bed was comfortable, 2 full baths & the kids loved the "hidden" shower. The yard was perfect for our dogs and I could have spent many more morning on the nice porch drinking coffee! If I could i would take this cottage to another beach. The walk to the beach was quick, look to the left and the covered ivy fence to find the secret passage. Great started supply of everything we needed, from coffee to filters, shampoo and soap for the kitchen. 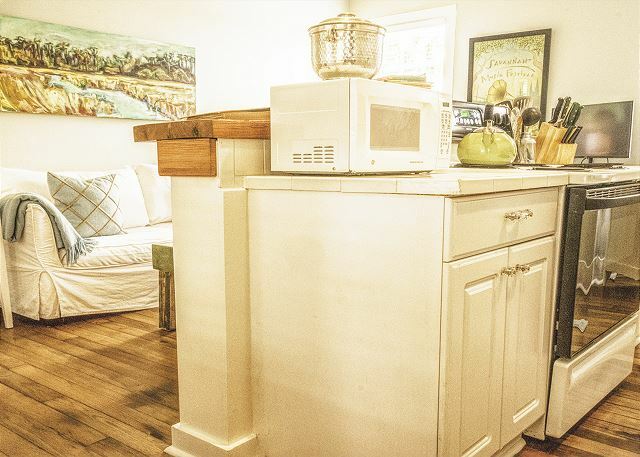 The kitchen is small so if you are planning on elaborate dinners this might not be the place for you. Overall we were very happy with the cottage. Great location, clean and cozy. Loved the wrap around porch. Unfortunately the weather was cold during spring break so we couldn't really enjoy it. I prefer a firm mattress, which these really were not, but were adequate. This place was perfect for our family of 3 plus dog. We would stay here again. We come out to Tybee often and have rented condos and homes. This was the first time utilizing Mermaid Cottages and the experience was very positive. 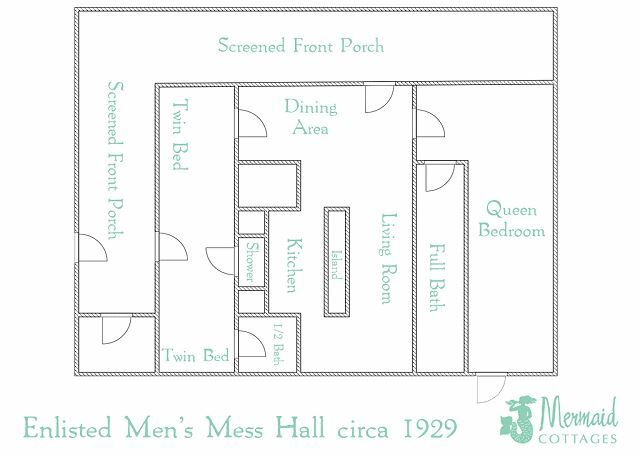 Enlisted Men's Mess Hall is in a quieter area of the island, Officers Row, amongst large historic homes. The property is very clean. The home is charming and nicely furnished. Having a washer/dryer was convenient, as we were there 5 nights and didn't have to pack as many clothes. For a small kitchen, it was well-stocked--I cooked Thanksgiving dinner without a problem. My only suggestion would be for a sharper chef's or santoku knife. Deeded access to the beach was a plus, we did take walks. Would definitely rent this place again. 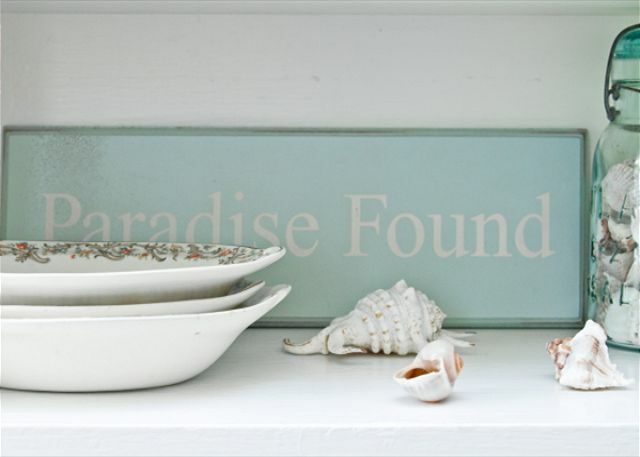 We absolutely love Mermaid Cottages! They do the very best job! This is our 5th year staying in the cottages and we love the experience every time! The cottage are so clean and decorated so beautifully! The cottage was adorable and so clean! We enjoyed our stay ! 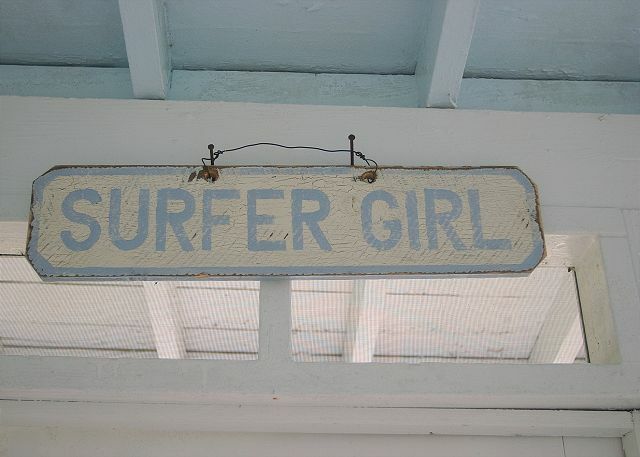 We love Tybee and Mermaid Cottages! We thouroughly enjoyed our stay at the Enlisted Mens Mess hall on Tybee Island and cannot wait to go back again! 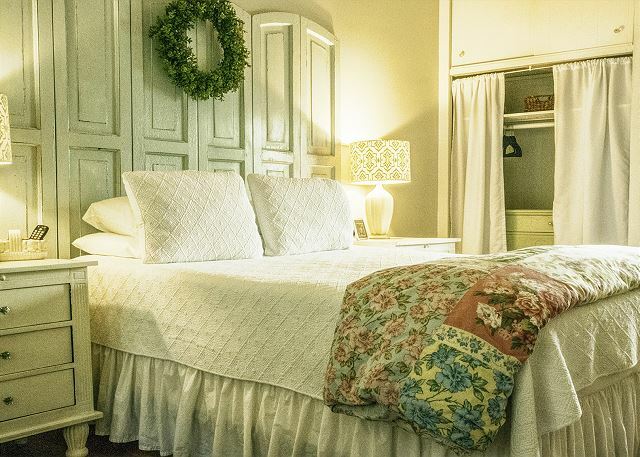 The cottage was adorable with it's vintage charm and bright and cheery coastal decor. It's in close proximity to the beach and many restaraunts a short golf cart's drive away. We would love to have read more on the history of the mess hall and pictures of it's previous life. Tybee Island is a magical place with so much history, great restaraunts and laid back style. We are looking forward to planning our next trip back! Thank you Mermaids!! This is our 2nd stay at the Enlisted Men's Mess Hall on Tybee Island. We love this cottage! It's in a great area, close to the lighthouse and North Beach Bar & Grill, short walk to a very quiet area of North Beach! 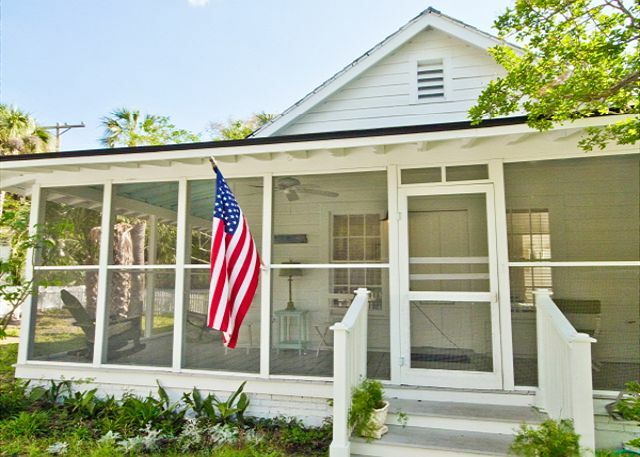 Perfect size for small groups, the front porch is amazing, we just love this area of Tybee! And the Mermaids always make sure that the cottage is clean, comfy, and cozy! First, this location was perfect for our needs. My mother loves lighthouses, so the location was ideal. I like that you can walk to the beach and to the lighthouse. The directions to the beach were a bit confusing at first, but once I found the hidden wood door and tiny path, it was fine. My family enjoyed the cottage and thought it was very cute. I hate to be picky (especially because the customer service was top notch), but my only complaint was that the shower curtain liner needed to be changed - it wasn't extremely dirty, but the bottom had moldy spots. I slept in the room with the larger bed and the bed and pillows were very comfy. I loved the pretty views from all windows. The porch was my favorite...like other reviewers stated, it was so nice to set in the rocking chairs on the big porch and drink coffee in the mornings. I LOVED the Mermaid Cottages brand coffee! Thanks so much for that! We had an enjoyable time and will return to Savannah/Tybee in the future. Enlisted Men's Mess Hall was absolutely beautiful! Had everything our family needed. Beautifully decorated, very clean, and felt very much like home. 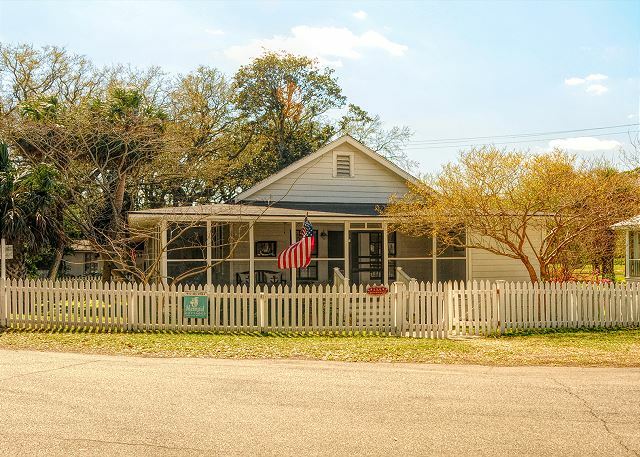 This property is a short distance from Tybee Lighthouse, which is a must see, and very close to everything from the Grocery store to places to eat and shop. We had a short walk to the beach with our own access. Approximately 3 minutes to get to the beach from Men's Mess Hall.. Our family had a Wonderful stay here! This was our fourth stay at Enlisted Men's cottage. We have stayed with Mermaids for a number of years and Enlisted Men's is our favorite. It is in a great location to walk to the beach,love the porch in the morning and evening. The cottage was clean and in great shape as always. It was a wonderful and relaxing trip. Will be back again and hopefully Enlisted Men's will be available. Cottage spotlessly clean. 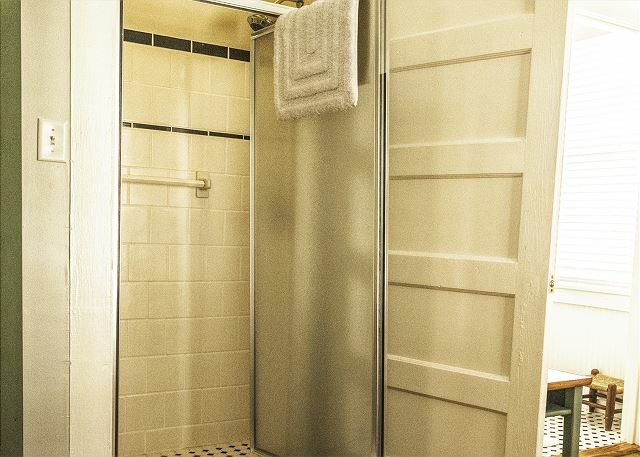 Quirky shower in a closet that was no problem. Attentive staff. Wonderful location. Would definitely stay there again. Needs more pots and pans and cooking utensils. And an extra set of towels. My family and I truly enjoyed our time on Tybee. The cottage was all we hoped for. Very relaxing, clean, and well equipped. Not to mention how helpful Mermids was. Looking forward to renting from them again in the near future. Very nice cottage and in a great location! I walked to the beach, the park and restaurants. Cottage was very neat and tidy. Great experience at Enlisted Men's Hall. Very quite and peaceful and great location. Exceptionally clean. Big Thanks to Beth for seeing that everything was clean. Enjoyed all the old books and the way the cottage was decorated from the old days. The only complaint I have is that the AC really wasn't working well. It was a nice little cottage perfect for 4 people. My parents joined us for the week, they are in their 70's. We had beautiful weather and thoroughly enjoyed sitting on the screen porch and watched the dog walkers, joggers etc. It is actually a busy street. Lots of choices for good food. The lighthouse & North Beach grill is within walking distance. The shower is amazing-the water pressure and temp-perfect. Also worth noting, the storm that hit this area at the end of 2016 damaged the cottage we first reserved and they quickly acted and got us into a comparable cottage. They weren't sure if the repairs would be done in time. Also others talked of Palmetto bugs - we saw none. The cottage couldn't have been any better for myself. A few nights my grandkids spent the night and the second bedroom was a perfect accommodation. I'd definitely lease it again. I retired last fall and did not want to spend another winter in Ohio, unnecessarily. I have been coming to Tybee for the past 5 years. My son is stationed in the Army in Savannah, so Tybee seemed to be the perfect escape. We loved Tybee Island and the beach. We liked the location. The only complaint we have was we did have a bug issue. Most were dead but a few were still alive. My favorite Mermaid Cottage. Our trip was cut short because Matthew decided to make a untimely visit. Enlisted Men's as always was perfect. 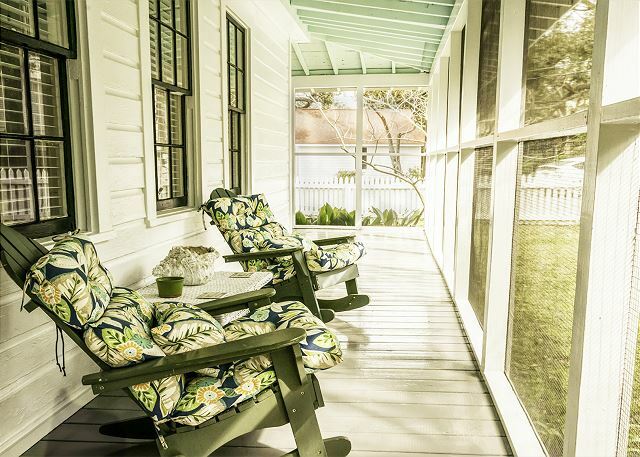 Easy access to the beach and love the front porch. I will always come back to Enlisted Men's and Tybee Island! The Mess Hall is lovely and sits on a lovely piece of property just perfect for relaxing. The caretakers/reservationists give perfect information on how to find it and how to enter. It is perfectly maintained and exceptionally clean. Our only complaint is that there were huge palmetto bugs in the Mess Hall. One even crawled into my suitcase and it came home with me - jumped out as I unpacked. Part of life in that area of the country certainly involves palmetto bugs (unfortunately) but we do recommend getting pest control in more often. 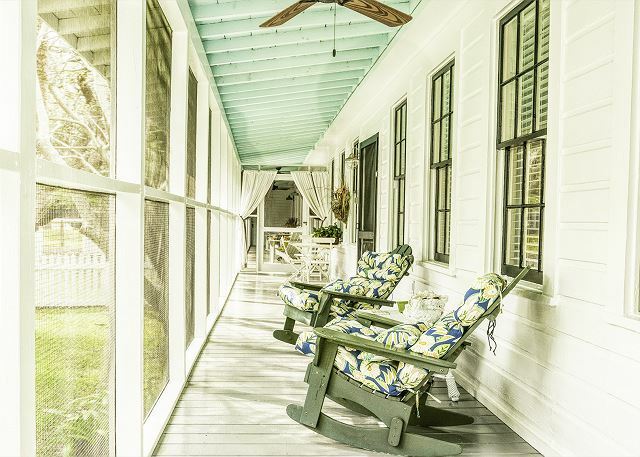 From the screened porch with rockers to the bedside tables with just the right combination of comfort and memorabilia, authenticity meets function in a rhapsody of perfection. If you like this kind of thing, stay here. We loved our stay at the Enlisted Men's Mess Hall! 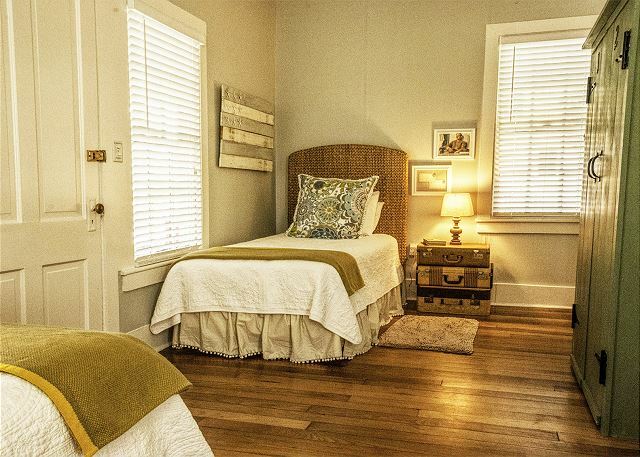 This is our 3rd year in a row coming to Tybee, and our 2nd stay at a Mermaid Cottage. My girls said this was their favorite place! Close to the beach, close to the lighthouse area, quiet North Beach location, wonderful place to stay! 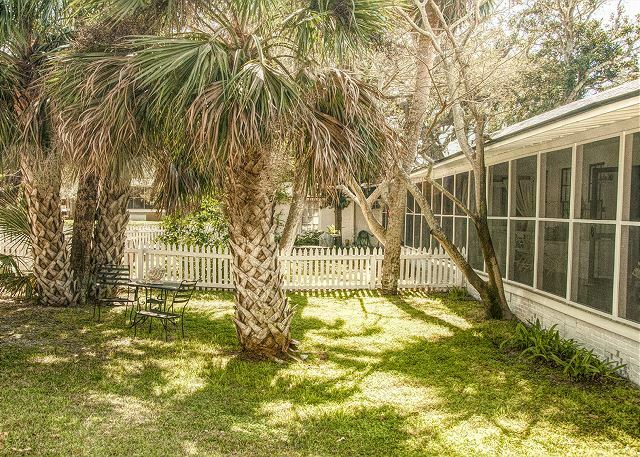 We will not hesitate to rent out the Mess Hall on future trips to Tybee Island! We had a wonderful mini holiday, and loved our stay at the Enlisted Men's Mess Hall. The trip was a treat for my mother visiting from Montana. Enlisted Mess Hall is wonderful! This cottage was exactly what I was hoping for and surpassed expectations!! The location was exceptional and the cottage was extremely clean and well-provided. There were 3 of us vacationing here and all of us were very impressed. I intend to rent this same cottage again when I need a quiet time at the beach. A beautiful property in a beautiful setting just minutes from a beautiful beach! Most enjoyable stay for Susans 70'th BIRTHDAY! This property met our expectations of being a homey cottage with a good layout. We were apprehensive because of Susan's breathing condition & the cottage being pet friendly. The cottage was very clean & neat with no sign of pets. The only frustration was the lock box and dropping that key and it going thru the cracks in the porch floor. I fished it & a previously lost key out of the crawl area. The lock box is a little difficult to close. The two house keys were difficult to use ( they are worn out and need replacement). Fixing the key situation would help future guests. We liked it that Linda stopped by to see how things were going. We loved it and would come back a month earlier. The place was perfect for our needs. Well maintained, very clean and just a nice beach cottage. WE really enjoyed our morning coffee in the screened-inn porch. We enjoyed the North Beach Bar and the Fish Camp for a more upscale dinner. This was our first visit to Tybee Island and it will not be our last. The cottage was so comfy and beautifully decorated. The layout was perfect and we loved the large screened in porch. The cottage was full of personal touches. The rental process was easy and there was plenty of parking. This is the second stay at the Enlisted Men's Mess Hall. The cottage is so well decorated and well laid out. We have stayed in several Mermaid's cottages, but I think this is my favorite. It is located in a lovely neighborhood and very easy access to North Beach. The screened porch is so comfortable and relaxing to drink you coffee in the morning or a glass of wine in the evening. The cottage was well equipped in all areas. The beds were very comfortable. The pictures of the cottage are an accurate representation of what you will find when you arrive at the cottage. Our furbaby also loved the fenced yard and being able to relax on the screened porch and watch the folks walk by. 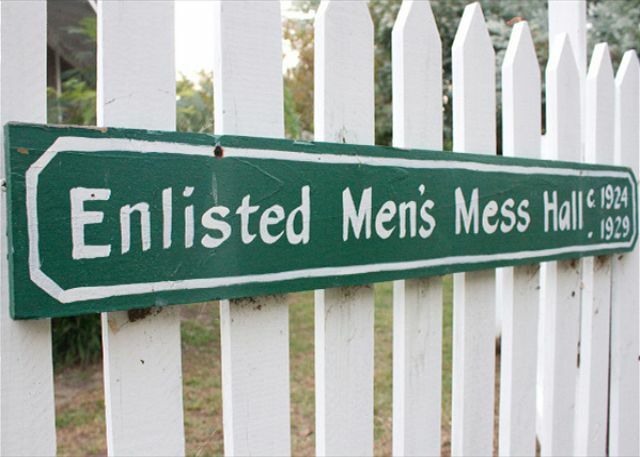 If you want a very cute and relaxing cottage I would recommend Enlisted Men's Mess Hall. I cannot say enough good things about our stay in Enlisted Men's Mess Hall. Our family was visiting Tybee for my brother's wedding. We stayed in Enlisted Men's Mess Hall and my parents and grandparents stayed in the other side, Screened Inn. This was a great setup for our family! The location was perfect. It was a peaceful neighborhood very convenient to the lighthouse and beach. We loved the way the units were decorated and we were impressed with how clean and well maintained they were. We spent a lot of time just relaxing on the porches. We liked being able to walk to Jaycee Park and walk on the walking trail. We will definitely stay here again. The Mermaid staff were EXCELLENT to work with and took care of everything from the beginning to the end of our visit. My family had a great time at The Enlisted Men's Mess Hall. The cottage was clean, cute and quaint! It is a short walk to the beach and seems to be on the quieter side of Tybee, which we enjoyed. There is also so much to do nearby if you decide you have had enough quiet time. We hope to be back soon! I stayed int he Enlisted Men's Mess Hall with my husband and two little girls in April. The house was even roomier than I thought it would be! It is tastefully decorated. There was a canister of delicious coffee awaiting, Mermaid Coffee, which was a nice treat. The master bedroom is large and has its own tv and bathroom with good sized shower/tub. The second bedroom is across the house, and a perfect set up for two little ones, with two twin beds and its own bathroom. No shower there, but not a problem for us. Though the master shares a wall with another unit (duplex) we were not bothered by noise. You have your own washer/dryer off the screened porch, as well as some beach toys. We basically lived on the screened porch—so wonderful for morning coffee, playtime, and to wind down the day! I love the street that it is on—beautiful and quiet. You are only two blocks from the beach, and around the corner from the North Beach Grill and lighthouse. You are around the corner by bike/walking path from a great park. So convenient! There is also a little fenced in yard that the girls loved playing in. We had a great stay here, and can't wait to return! My son stayed at the Mess Hall for his wedding weekend. It was the perfect location for him and his new bride to start their life together! We thourghly enjoyed our stay at the cottage. It was just right for our group of three. Everything worked, and we enjoyed the blissful coffee that was provided. Thanks to the Mermaid team. We arrived late at Mess Hall to find it wasn't quite clean. It was adorable! The mermaids sprung into action and moved us to A Mermaids Tale, which was not quite as cute but had more room to spread out. It ended up working out great. We appreciated their quick response and kindness. Both houses were nice, and Curt who lives near A Mermaids Tale was extremely helpful. We love Mermaids, we love Tybee and we will be back! We had a wonderful time on Tybee Island and the stay at Emlisted Men's Mess Hall was good. Overall, our visit to Tybee and our stay in the Enlisted Men's Mess Hall Cottage was wonderful. The size of the cottage and the accommodations were just right for our group of four: it was clean and comfortable and the kitchen was adequately equipped for most of our meals. The beach was easily accessed and within walking distance. We were thinking of a return trip in a future October from the beginning of the stay. 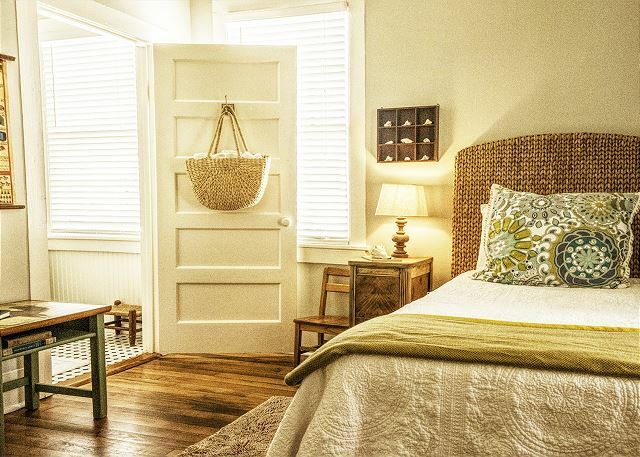 What a great place to stay while visiting Tybee island for the first time! The cottage was great. We loved how close it was to beach and some great places to eat. We will definitely be back! 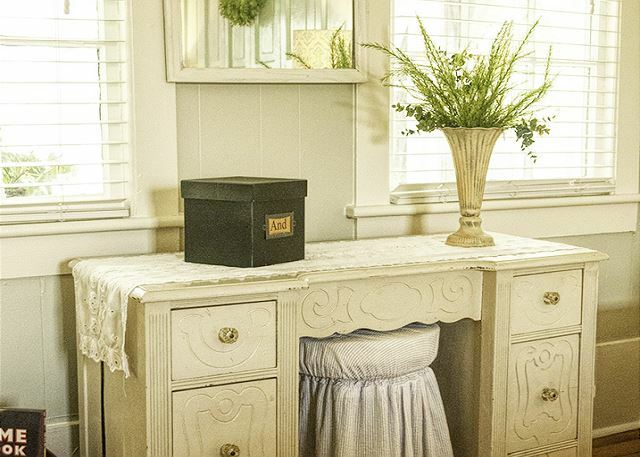 The Enlisted Men's Mess is a welcoming cottage brimming with charm. I couldn't wait to open the gate, walk up the stairs to the screened porch and put the key in the door. The cottage was very clean and the location quiet. The beach is close by. One of the best parts of the cottage experience was the excellent service provided by Mermaid Cottages. Not only is their app very easy to use and answers every question, but I received two personal phone calls before my stay to answer questions and offer suggestions for dining and touring. thank you for loving our app! we do too!! thank you for staying with us! We loved the location, the very short walk to the beach,the lighthouse and the Fort Screven Museum. The neighborhood was quiet and everyone we met was friendly and pleasant. It was a quick drive to the historic district in Savannah. The house was perfect for a mix of dining in and eating out! Very nice place. I loved the large wrap around porch, large laundry, large master bed and bath. This place was great for the furry children to play on the porch. It has a nice yard too. It would be a great place to stay with children too. I would definitely stay here again as well as other Mermaid Cottages, but since I'm a vet I LOVE this used to be used by the military. 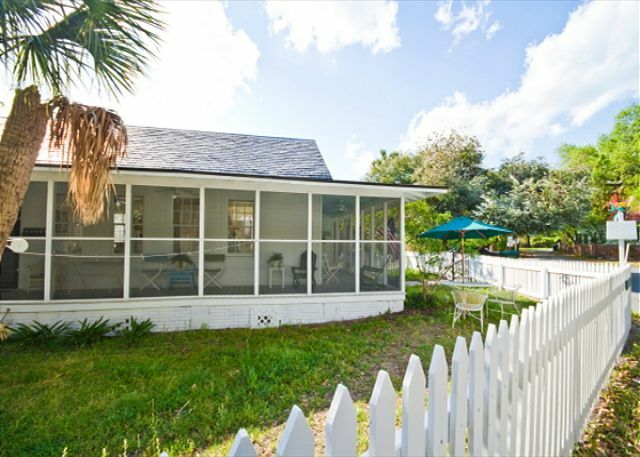 Great small cottage, just off a wonderful part of tybee island beach. In quiet laid back part away from hub bub of t shirt shops and ice cream joints. Place well appointed with well equipped kitchen and comfotdble beds. We enjoyed our stay in the mess hall, just loved the shabby chic decor . It was very quiet and peaceful and in a lovely setting. Overall was clean but I thought the sofa and chair needed a little extra cleaning . I could see pet hair in the sunlight and dingy spots . I loved the mess hall though and will be staying there again when I come back to Tybee . This was our second stay at the Mess Hall and no surprise it was wonderful. It's a great, quiet area with friendly neighbors and a lovely park right behind the cottage. The new direct route to the beach is a plus. Clean and well outfitted house with books and games for kids, a functional kitchen, and a much needed washer and dryer. When we arrived, the house was just as pictured. It was the perfect size for our family of 4. The location couldn't have been better with just a short walk to the beach. The beach was beautiful and absolutely perfect. It was so quiet and the kids loved seeing the dolphins swimming so close and the ships that were leaving to sea. I recommend this property to anyone who wants a relaxing vacation with no pressure to be out and going all day long. The cottage was beautiful and had easy access to the beach. The rooms were comfortable and when we had guest over the porch was wonderful for entertaining.The only draw back was lack of cooking pots and pans. We struggled making a nice meal for our friends we were having for dinner. We love to cook, the kitchen space was nice and easy use with guests but struggled with small skillet and no cookie sheet. Next year we will bring some pans from home. Was not a big deal we assume most people go out to eat on the island. 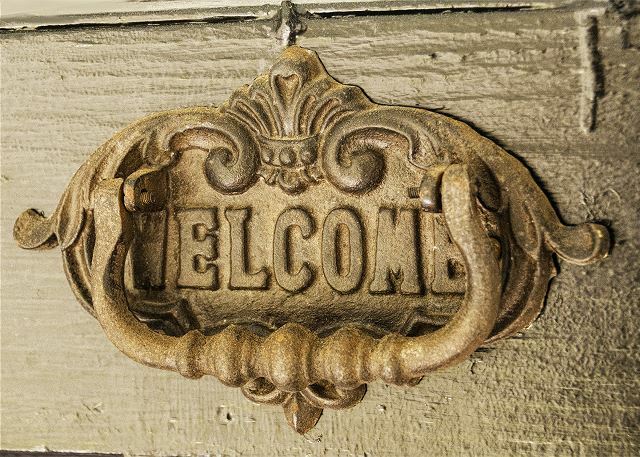 thank you- just a reminder, we have 24/7 guest services and we are always happy to bring over to you whatever you need. we try and stock our homes with everything we can think of, but we are always happy to provide that special request needed. keep that in mind for your next visit! The Enlisted Men's Mess Hall cottage is better than we could have imagined. 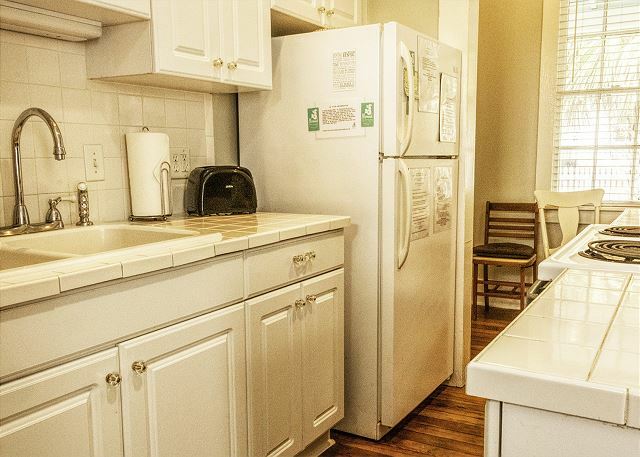 It's super cute, comfortable, clean, well-stocked, and a great location. The beach is just a short walk away, and the streets are shady, quiet, and perfect for a stroll. Our favorite spot was sitting on the porch with our morning coffee! And the ladies at Mermaid Cottages were beyond helpful and hospitable. We are already planning our next stay here! This was our second year at the Mess and we just love it. The decor, size, and location make this cottage just about perfect for 2-4 guests. 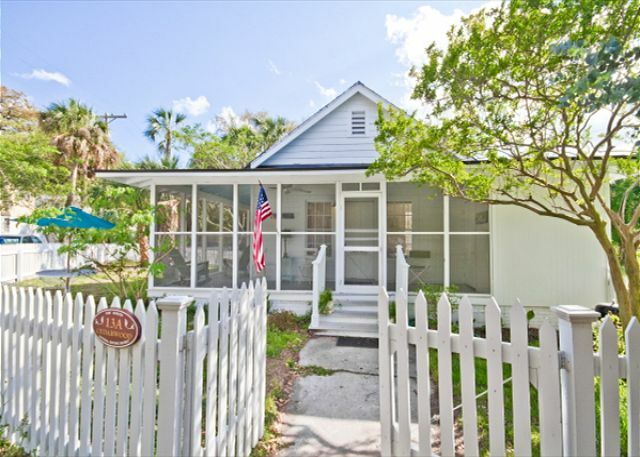 The walk to the beach is easy and quaint, the porch is perfect for relaxing and the area is quiet and peaceful. Even on Memorial Day, we had our own space on the beach without feeling crowded. We will definitely return to this cottage, as we've been coming for 10 years now and have always stayed with Mermaid Cottages. The Enlisted Men's Mess Hall was a very nice accomodation for the three nights we were there. Unit was very clean and tidy and was furnished with everything we needed for our short vacation. I had only one small compaint. The BBQ grill provided at the unit did not have the correct size grill on top and required a bit of finesse to utilize. Would definitely rent this unit again! Very nice. We had an amazing time. Nice easy walk to the beach. Grocery store nearby. Easy to find beach towels and blankets (you'll need these if you don't have your own). Quiet and no smoking allowed. Just member to follow the instructions for the thermostat. Will definitely stay again. 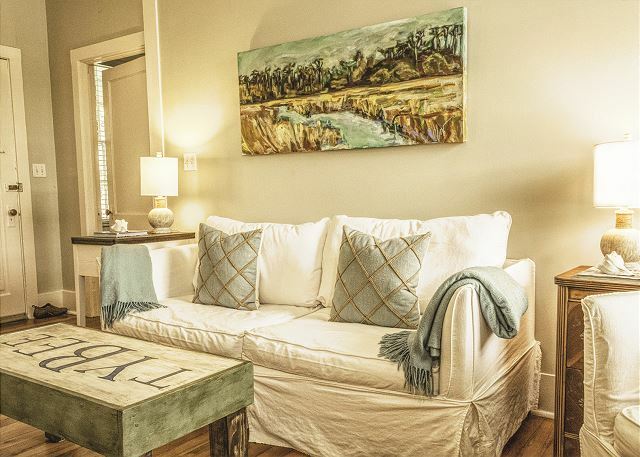 This cottage is simply the only place to stay in Ft. Screven. The service is exemplary and furnishings perfection. We will be back as soon as there is an opening! The duplex was rented for a family vacation. I came from Cary, NC, one daughter came from San Francisco, CA with her husband and my two grandchildren ages 8 and almost 15 and my other daughter came from Santiago, Chile. The accommodations were fabulous. we spent a day in Savannah, went on a boat to see Dolphins, climbed the lighthouse, walked on the beach, went kayaking, ate some great food, even tasted boiled peanuts! Will definitely come again!. Great Time at Tybee Island! 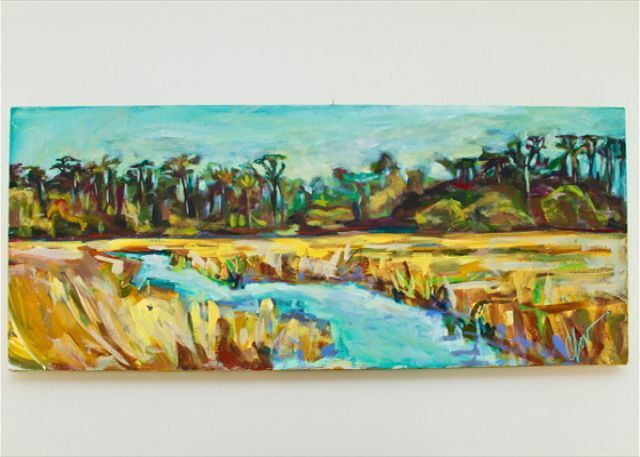 The cottage was a perfect location for walking to the beach, or making day trips to Savannah. There was plenty of room in each cottage so we weren't in each other's hair during the rainy days or after the sun went down. The kitchens were perfect for making shared group meals, and we really weren't missing any vital utensils. Everything was clean when we arrived, and comfortable enough that we didn't want to leave. We had a wonderful time. Brought 2 of our dogs, who loved the screened porch and fenced yard. The house was clean with plenty of linens. Nice neighborhood and easy access to the beach. Plan to visit again this summer. We loved Tybee, Savannah and Hilton Head, all of which were easily accessible from our cottage on Tybee Island. Our cute house was dog friendly, even dog dishes, a toy and treats. Oh, and and ID tag our dog used! We had a wonderful screened in porch where we spent hours in the evening talking, playing games and letting the dogs play. The only omission in the cottage was a salad bowl, soup ladle and soup spoons! WE HAD A GREAT IME ON TYBEE. THE LOCATION WAS QUIET AND PEACEFUL. WE DID NOTICE THE DISAPPEARING ANGEL??? SHORT HIKE TO THE BEACH, NORTH BEACH GRILLE. 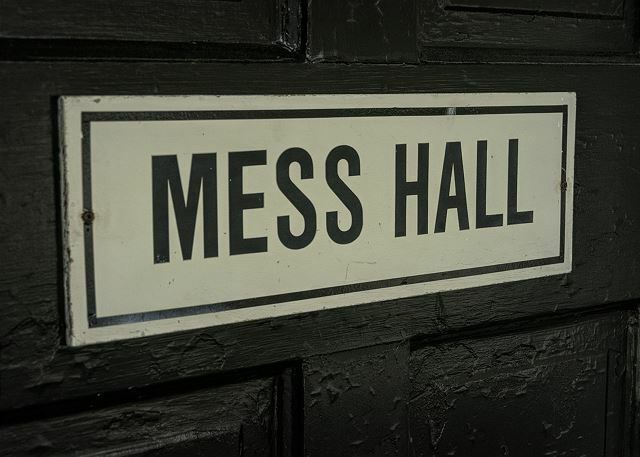 The Enlisted Men's Mess Hall is on a quaint, quiet street. Loved the interior and the screened in porch. It has a very welcoming feel to it making us feel right at home. We had our cats with us and the porch gave them time outside without the worry of losing them. Loved being able to ride bikes around the island. Not too much traffic made for a very pleasant ride. There were only a few issues. One being the fan in the master bedroom was extremely noisy and smelled as if it was burning. We just turned it off. I was disappointed with the beach near our cottage. It is in the shipping lane, the sand had a black film on it and the ocean off limits due to underwater hazards. But,the beach on the lower end of the island near the pier was beautiful. We spent our beach time there. Ended up paying to park but that was a small concession for the time on the pier and in the ocean. All in all it was a wonderful vacation. We would definitely return. Premium price paid for no cleaning. Still ok though. We stayed here before for over 2 weeks and liked it, and this time stayed even longer and rather liked it better than what was available. First, the people at guest services are very nice and helpful. My major gripe is the lack of house keeping options for people staying for a long time. I do not want to clean somebody else's bathrooms, toilets, kitchens, beds, floors, etc., etc.. You get the idea. The bugs and cockroaches come out too. The kitchen is supposed to be stocked but we had to buy some items for the house. We bought placemats for dinner table, measuring cup, straining spoon, pizza cutter, Tupperware, kitchen knife (better one for actual cooking, not for camping), assorted condiments, cleaning supplies, wall outlet extenders, and toilet paper/paper towels. We found ticks on our bodies from walking through the bug, mosquito, tick infested pathway to the beach. They need to bug bomb the route. Also, it's mosquito heaven by the outside water hose and the water pools under the house after it rains. I'm griping but we had a great time. If only they cleaned once a week, that would make all the difference. And I have nothing but nice things to say about the people working the guest services phone. Oh, I also re-directed my Amazon purchases down to the address at the cottage. If it's being delivered my USPS, you will need a PO BOX or have it all delivered to the main Mermaid Cottage address. Guest Service will help you sort it out. 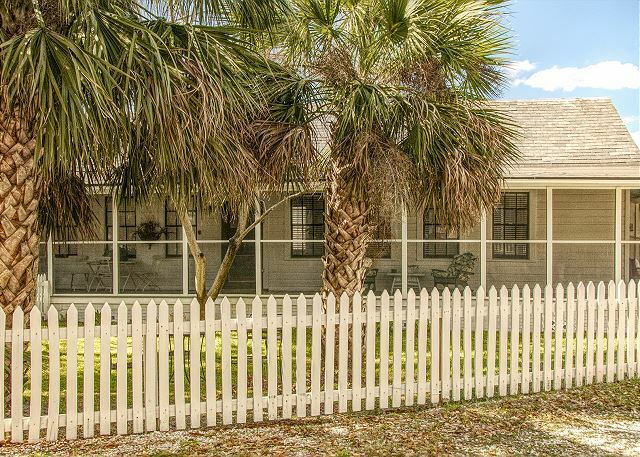 We rode past the Enlisted Men's Mess Hall on an earlier Tybee trip and wondered what it would be like to stay in such a perfect little cottage. It more than surpassed what I imagined. From the decor to the screened in porch, every detail was perfect. 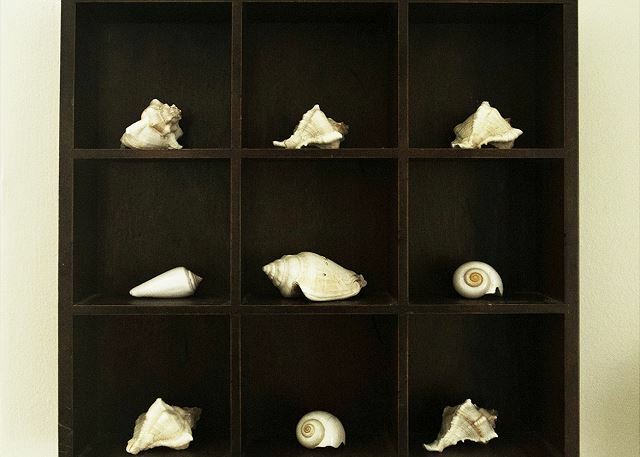 The Mermaids thought of every detail to make our stay one that we can't wait to repeat. As my daughter said, it just felt like we belonged there. Highly recommend this as a relaxing retreat. We loved the house, especially the screen porch! The eucalyptus tree and mimosa trees were an added bonus. 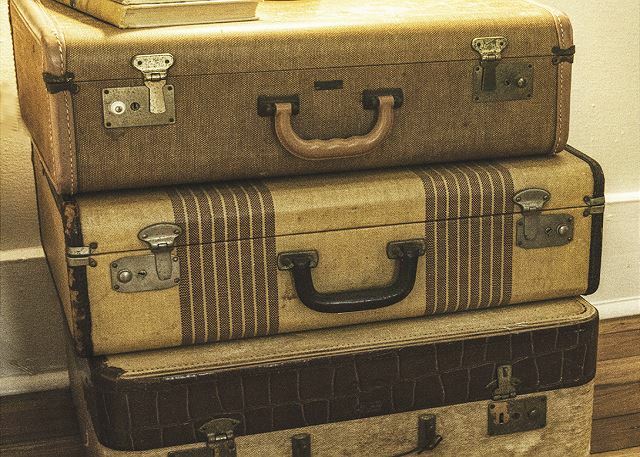 The furnishings and vintage collectibles added to the vacation experience as well. It is also very close to an uncrowded area of the beach and to Jaycee Park which has a paved bike/walking trail and playground. We will definitely be staying here again! -in porch is the best part of the house. Perfect for morning coffee and a place to site and reflect on the day's adventures. Though my husband saw one of the Mermaids, I don't believe they are real people - magic the way you email a question or request and your request is granted along with a fun note!!! We were lucky to have great weather and took several trips to the beach. The north side of the island and the Fort Screven area is perfect. 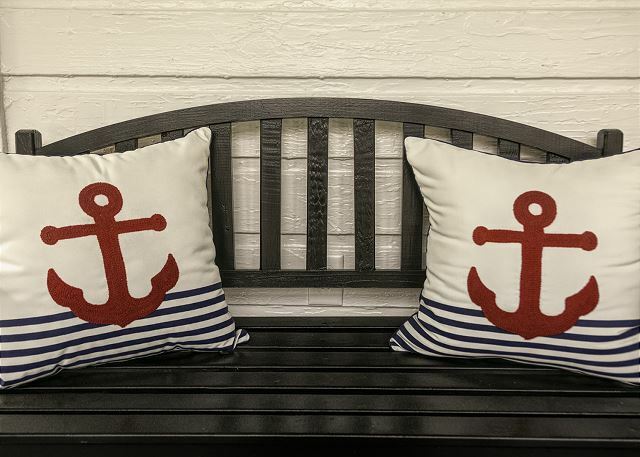 Just one suggestion - the porch needs a wicker sofa with cushions for afternoon naps. We stayed at Enlisted Men's Mess Hall the first week of June and loved it! It was our first time to stayon Tybee Island and we will definitely be back. I was taken by the cottage from the website photos and the online reviews were very good, so I booked it. I liked the antique, beachy decor and nostalgic, historic feel of the cottage. 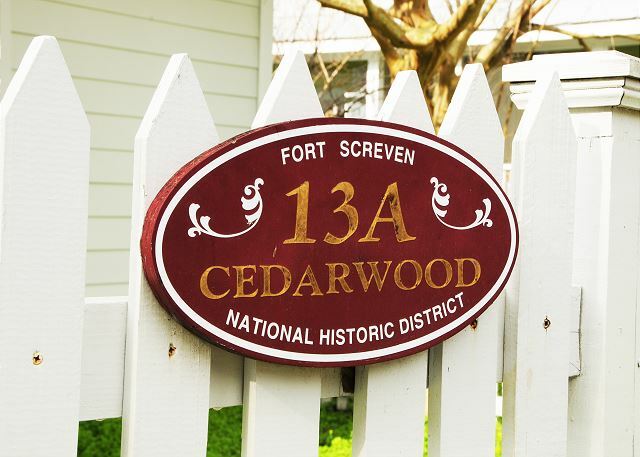 The history with Fort Screven gives the place added character. The screened in porch was my favorite part of the cottage. It was so nice to sit out there in the morning sipping our coffee and enjoying the birds, etc. We really like the north part of the island; not so busy, less traffic and more subdued than the southern area near the downtown area. A short walk to the beach and a great park right around the corner. The only negative is that the Mess Hall is divided into two rentals and there was a young family in the back half and their little kids were up and running on the old wood floors ealy in the morning; not a problem with me but my wife likes to sleep in and that did not happen. All in all, a very comfortable and relaxing place to stay. We have very fond memories of our week there and will definitely rent a cottage from Mermaid again in the future! Great location on the north side. Parking was a bit tight, but it worked out. The fenced yard was a great plus for our dog - she really enjoyed her stay - almost as much as we did. We will stay here again! Thanks Mermaid Cottages! I love this little cottage. It is the perfect size for the two of us with our dogs. The location is perfect. We walked to the beach, so no parking fees, which is a savings. I would have given 5 stars if not for one thing. The master bath could use a little Tilex, there is a mildew issue around tub. Other than that it was perfect. Best 2 days at the beach ever! I was totally impressed with this property! My daughter actually convinced me to book us here and I am glad she did. Spotless and cute as a button being built in 1929. I Loved the screened in wrap around porch. We just need to stay longer than 2 days next time! Such a wonderful little place...would love to go back again and again! We stayed at Enlisted Men's Mess Hall the first week of April and loved it! It was our first time to Tybee Island and we will definitely be back. We fell in love with the cottage as soon as we walked in, I loved the antique, beachy decor! The screened in porch was my favorite part of the cottage. We had beautiful sunny weather in the 70's all week and it was so nice to sit out there in the morning sipping our coffee and listening to the birds. In my opinion, the cottage is located in the best part of the island. A short walk to the beach and a great park right around the corner, great for walking our two dogs...a very nice option since dogs aren't allowed on the beach. We have very fond memories of our week there and will definitely rent this cottage again in the future! We love coming to Tybee Island, it is relaxing and very friendly. We are still hoping for a King size bed. It seemed not quite as fresh as last year but happy to see the rocks by the gate. The birds were marvellous to see. We loved our stay at Mess Hall. There were many thoughtful little extras, especially for the dog. We would have preferred a King size bed instead of Queen. I have been visiting Tybee Island since 1990 and have always loved the quant charm of this little beach town. It has grown and changed in the last 23 years. This visit was the best Tybee Time that I have ever had. The Enlisted Men's Mess Hall was wonderful and I brought two friends with me who had never been to Savannah or Tybee. They had such a wonderful time and loved it so much that they both plan return trips to the area and want to stay with the Mermaids at Mermaid Cottages. The Mermaids made the trip so easy to plan and took care of our every need right down to the directions and easy entry at the cottage. There was no line to stand in checking in at a hotel and it was so quiet with no one going up and down halls making noise. All you can hear is the birds singing. I will never stay anywhere else on return trips to Tybee. Charming describes the "Mess Hall". Spanky clean, convenient to beach and if you are lucky a "treat" at the Tybee Theatre. Perfect vacation!! !